Gastritis is inflammation of the stomach lining. The main acute causes are excessive alcohol consumption or prolonged use of nonsteroidal anti-inflammatory drugs (also known as NSAIDs) such as aspirin or ibuprofen. In some cases, the stomach lining may be "eaten away," leading to sores (peptic ulcers) in the stomach or first part of the small intestine. Gastritis can occur suddenly (acute gastritis) or gradually (chronic gastritis). In most cases, gastritis does not permanently damage the stomach lining. Several tests can be used to make a diagnosis. 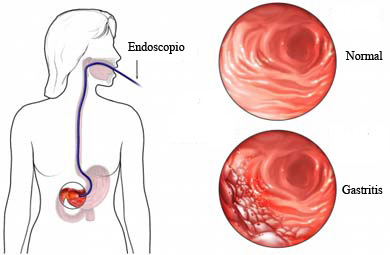 These include endoscopy of the stomach, where a thin tube with a light and a camera on the end is inserted down your throat into your stomach. This allows the doctor to see into your stomach and take samples (called a biopsy) from the lining if needed. The laboratory tests you may need will depend on the cause of your gastritis. A stool test may be used to check for the presence of blood, or a biopsy may be taken of the tissues of your esophagus or stomach. A breath test may detect H. pylori, or samples from your esophagus or stomach may be taken to look for this bacteria. During the gathering health history, the nurse asked about the signs and symptoms in patients. Does the patient have heartburn, can not eat, nausea or vomiting? Does the patient have symptoms occur at any time, before or after meals, after ingesting spicy foods or irritants or after ingesting certain drugs or alcohol? Does the patient have symptoms associated with anxiety, stress, allergies, eating or drinking too much, or eating too fast? how the symptoms disappear? Is there a history of previous gastric or stomach surgery? Historical diet plus a new type of diet eaten for 72 hours, would help. Full history is essential in helping nurses to identify whether excess dietary frivolous known, associated with current symptoms, whether others in the same patient has symptoms, whether the patient vomited blood, and if the elements are known to have ingested causes. Imbalanced Nutrition, Less Than Body Requirements related to inadequate nutrient inputs. Risk for Fluid Volume Deficit related to insufficient fluid intake and excessive fluid loss due to vomiting. Knowledge Deficit: on the management of diet and disease processes. Acute Pain related to gastric mucosal irritation.